A basic theme compatible with the standard layout. 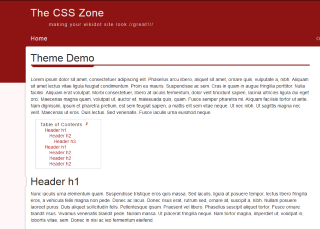 Standard Red is a theme that extends Bootstrap's base CSS and the Standard Theme. It adds basic flair to your site so that it appear professional regardless of the device viewed on. Using a subtle mix of round and sharp elements, the theme is fierce, yet elegant. Feel free to explore some of these basic color variations; if none of these suffice the needs of your site, then try out the Standard Theme Colorification tool!